After your user account is created initially, an automated email message is sent to you so that you can set up a password for logging in. 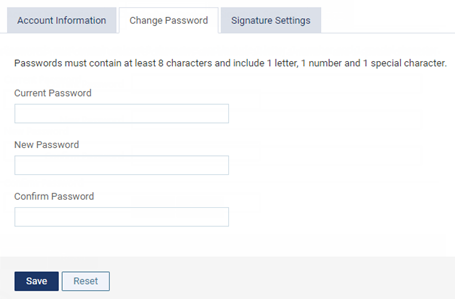 After you create a password, on the My Account page, you can change your password at any time. Note: Only you can change your password. Administrators (or, if you are an administrator, other administrators) do not have access to your password and cannot therefore change it for you. On the My Account page, on the Change Password tab, type your Current Password, and then type a new password in the New Password and Confirm New Password fields. When you change your password, a notification is sent automatically to the email address entered for your user account. On the My Account page, on the Account Information or Change Password tabs, you can click Reset to send yourself an email message with a link to reset your password. The message is sent to the email address entered for your user account.